Savannah State men’s basketball coach Horace Broadnax held his annual SSU youth basketball camp June 11-14. Broadnax and his assistants Clyde Wormley, Pat Hardy and Joe Fleger ran the camp, which attracted over 100 youngsters from ages five to 14, but not without the help of former SSU basketball standouts Jovanni Shuler, Jyles Smith and Troyce Manassa. 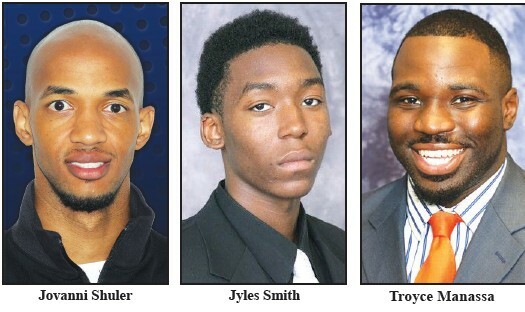 The trio, who are now in the professional ranks, returned to the campus to help their former coach as a way to give back and to let the campers known that SSU is the place where they got their start and earned their undergraduate degrees. “It’s good that they come back,” said Broadnax. “I would like for everyone to come back because it’s positive for the program,” he added. While in Denmark, Smith won a few awards such as making the all defensive team, earning Defensive Player of the Year and winning a slam dunk tournament. This past season, Smith averaged 10 points, 6.4 rebounds, 1.2 blocks, 1.1 assists and 1.0 steals per game while shooting 52.6 percent from the field. The 6-foot-10 Smith played for the Tigers from 2011-14 is the program’s all time leader in blocked shots with 320. Shuler finished his career at SSU during the 2010-11 season, averaging 18.1 points, 5.1 rebounds, 1.97 assists and 1.33 steals per game. This past season, the Lake Placid, Florida native played in Luxembourg, which boarders Germany and France, where he averaged 22.1 points, 8.3 rebounds, 2.7 assists and 1.8 steals per night while shooting 55.1 percent from the floor. He has a option to return to Luxembourg but is also looking into options to play in Japan, France or Portugal. In his previous years, his career has taken him to Iceland, Kuwait, Portugal, Chili, France and Germany. Shuler, who has helped with the camp for a number of years, will remain in Savannah after the camp is over. “I will stay in town to train with some former teammates and others like James Sinclair and Marquis Cummings to help stay in shape.” Smith also plans to remain in town a while following the camp. Manassa recently ended his first professional campaign where he played in Mongolia. In early April, the 6-foot-4 Manassa nearly had a triple double with 37 points, 13 rebounds and eight assists. He ended the season averaging 24 points, nine rebounds and 6.3 assists per night and was named to the all star team where he earned most valuable player honors. During his two years at SSU (2015-17) after transferring from Wallace Community College, Manassa left with a career average of 14.5 points, 5.1 rebounds and 2.6 assists. Manassa admits that he had to make some adjustments when he first went to Mongolia. “The biggest culture shocks were the food, language barrier and the weather, although it is a beautiful county.” He added that sometimes the temperatures can dip to negative 30 degrees.